"Lo que Rajoy nos dejo" (What Rajoy left us with) is a drama that talks about climate change, the lack of renewables and the high taxes of the Spanish sun. The movie was inspired by the epic historical romance film "Gone with the wind", featuring Mariano Rajoy the president of Spain and Alvaro Nadal the minister of energy, in the roles of Clark Gable and Vivien Leigh. 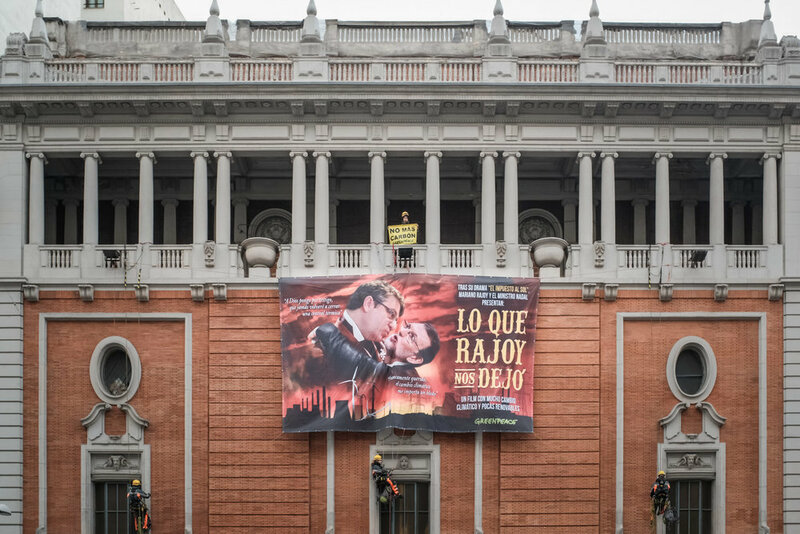 Greenpeace activists advertised this special feature movie on the wall of the Palacio de la Musica, an emblematic movie theatre in the city center of Madrid. Environmentalists aim to portray that the Spanish government continues playing the "old movie" still using dirty energy resources like coal or nuclear energy thus breaching on the European renewable targets or legitimising the sun tax.